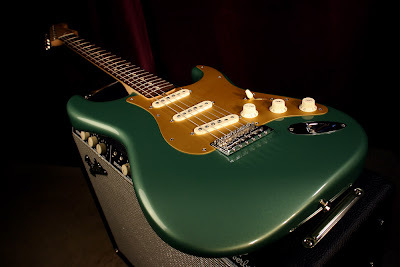 ProGuitarShop.com- a Fender Custom Shop Showcase Dealer, currently lists this NOS '60, Sage Green unit. Click the photo for more details and photos. I'm diggin' the gold anodized pickguard against the metallic sage nitro, which gives the vibe that this axe was created at the mint. Check out the old school staggered pole pups too! And it's sitting atop a Vibrolux Reverb RI.